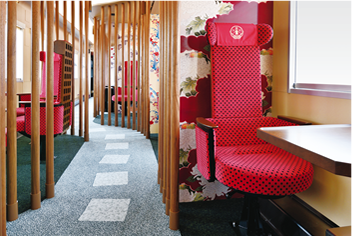 Based on a concept of "hospitality through Japanese tradition and beauty," the exterior design is inspired by Hokuriku's traditional arts, Wajima-nuri lacquerware and Kaga Yuzen dyeing. 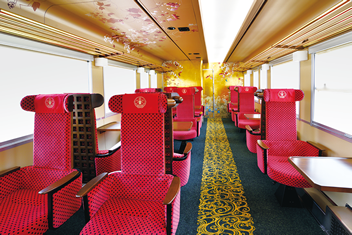 The first car has 8 semi-private compartments, offering a comfortable space for relaxing travel. The aisle is carpeted with a stepping stone pattern in the Japanese garden, and each compartment features a collection of classic Yuzen designs. The second car features original rotating seats characterized by crimson fabric and a wooden grid in the back, and the aisle depicts flowing water. 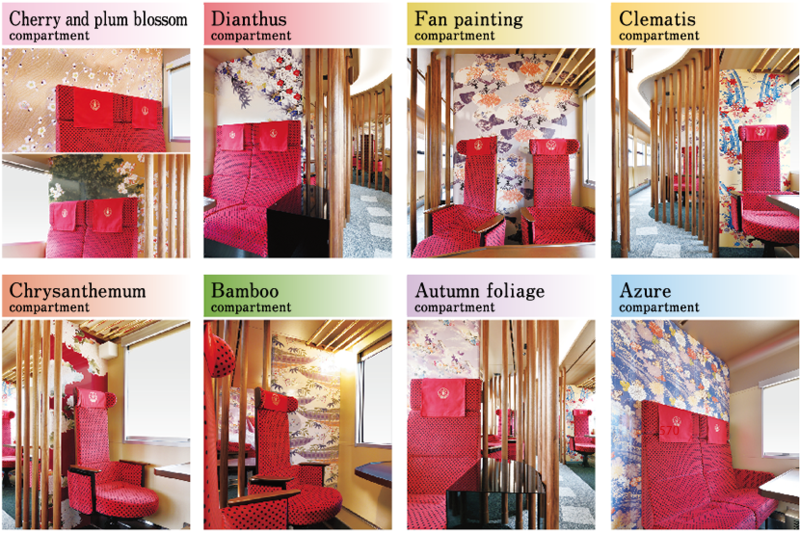 The interior design incorporates traditional Wajima-nuri lacquerware patterns. 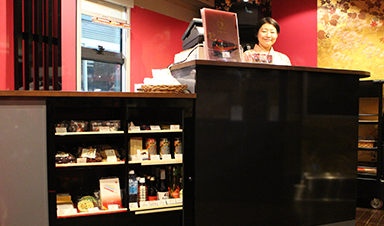 HANAYOME NOREN offers an immersive atmosphere full of Hokuriku's traditions and beauty. 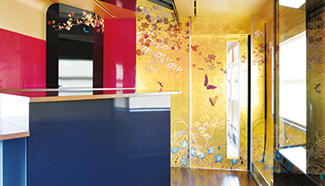 The entrance to Car 1 features a traditional Japanese design using classical Wajima-nuri lacquerware patterns and Kanazawa gold leafing. The traditional craftwork exhibition space is also decorated with Kanazawa gold leafing and displays the traditional crafts created in the area along the route. The event space in Car 2 is the venue for events including traditional art performances and taste-testing as well as sales of local products. * Operating days for and after March 2020 will be announced later. 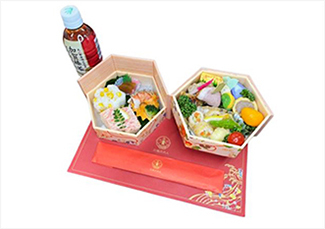 This set includes local Kaga cuisine made with seasonal ingredients prepared by the venerable restaurant O-tomorou, founded in 1830, for a menu that incorporates the unique tastes of a traditional Japanese restaurant. 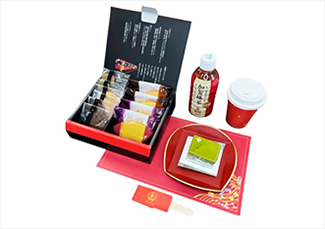 This original set features cakes and cookies selected by world-renowned patissier Hironobu Tsujiguchi, owner of LE MUSĒE DE H.
This set includes food by the venerable restaurant O-tomorou, founded in 1830 and specializing in traditional Japanese side dishes, as well as Junmai-ginjo sake (pure sake made from highly milled rice) made by Sogen Shuzo, a Noto sake brewery. * This set is only sold to customers of legal age to drink alcoholic beverages. * Photos are all images and may differ in detail from the actual food. * The content of the food options may change depending on season and supplies. 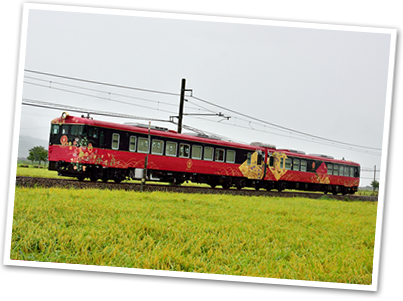 These tickets are only available when traveling between Kanazawa Station and Nanao Station or Wakura Onsen Station. 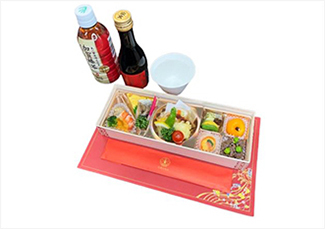 Food tickets are only sold when you are purchasing a passenger ticket for the relevant HANAYOME NOREN or if you already have a passenger ticket for the relevant HANAYOME NOREN. 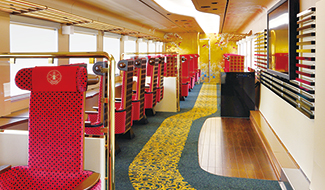 On the tourist train HANAYOME NOREN, beverages and alcoholic drinks, sweets and snacks, traditional crafts, and original goods related to the areas the route passes through are sold at the merchandise space in Car 1. * The available merchandise is subject to change due to supply. 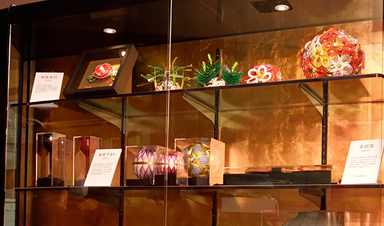 Passengers can see an excellent selection from Ishikawa's numerous traditional crafts developed by the rich traditional culture of the Kaga domain, including the Kaga Mizuhiki string work, Wajima-nuri lacquerware, and Kaga Temari balls.